A new music program to benefit those with dementia was recently introduced to residents at The Bridges Assisted Living & Memory Care Community in Riverview. For the past two years Kristin Reagin, daughter of Tom and Lynn Reagin of Valrico, has volunteered every Sunday at The Bridges. As Kristin played the piano and sang with the memory care residents she realized the positive affect music had on them. When it came time to considering a project for her Girl Scout Gold Award, Kristin knew it would involve music and individuals with dementia. Kristin’s project “Medicine for the Soul,” is based on extensive research conducted on the effects of music on individuals with dementia. “I am extremely passionate about this topic since I know how music can help bring joy to the lives of those with dementia. I also know that music has been scientifically proven to tap into memories that had otherwise been forgotten,” Kristin noted. Kristin’s goal to utilize donated iPods and create genre specific playlists for each iPod came to fruition; she recently presented the program to residents and staff at The Bridges. The idea was only the first part of Kristin’s project. Next came fundraising, applying for and receiving a grant and collecting used iPods through various drives. With over $750 raised, Kristin provided 9 iPods with headphones, a charging station, a housing container that can be locked, and music from iTunes. The best and most rewarding part was yet to come. 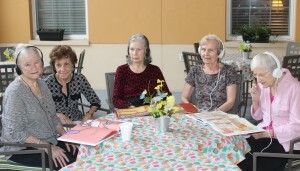 “When I placed the headphones on the residents and they began to sing and smile, I saw first hand that my project was working and residents were responding positively.” Donna Steiermann, Executive Director at The Bridges, foresees many benefits for residents. “’Medicine for the Soul” will be a wonderful addition to our community and will improve the quality of our residents’ lives,” she commented.